Why do I say perfect? Well because cooking a pork sausage is not that easy. They can burst, brown too much on the outside and be raw inside and they can also taste bad. 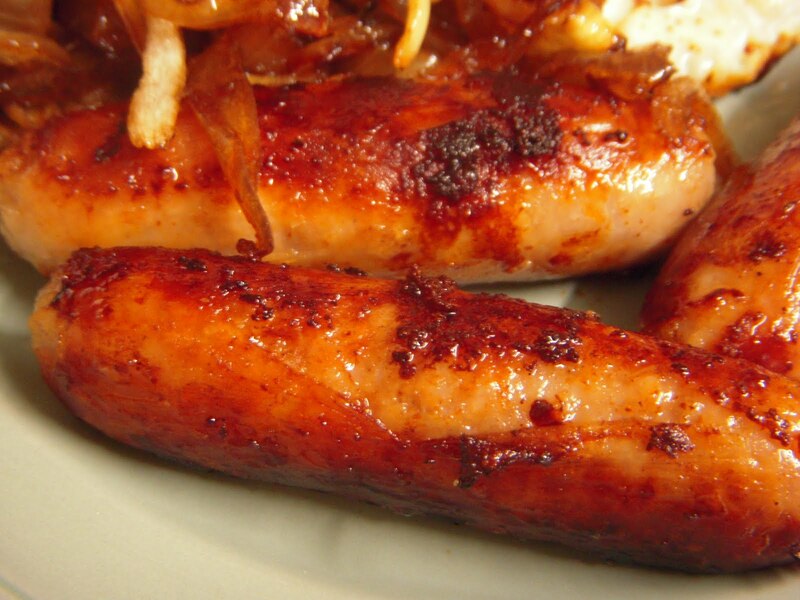 I have eaten a lot of commercially packed pork sausages and they vary enormously. In our part of the world there are very few decent sausages. The Eskourt brand is ok. Not great, but better than many others. Not badly spiced, and appears to have a reasonable amount of real pork in them. The best choice is to check out a few butchers own packed sausages. Even there we have a problem. I would say 90% of butchers produce a pork sausage by mixing their pork mince with a commercial, pre-packed "Pork sausage Mix" Which means that all these butchers produce very similar sausages, and regretfully, they all contain MSG a vile over used flavour enhancer which is so not good for you, and is a little known,major cause of migraines in migraine sufferers. So whilst you may be happy with your butcher, shop around for sausages. Ask 2 questions. Does he mix his own pork sausage spices and herbs. Does it contain MSG. So now you got your good quality sausages what do you do? chop a single large segment of garlic finely. With breakfast you need to be careful with garlic. Just a hint. A little splash of sunflower oil in the pan. Lay the sausage in and sprinkle the garlic on top. A twist of the black pepper grinder. Bring up to a low heat slowly. They should barely sizzle. They must be covered the whole time. After 15 minutes turn the sausages to brown the other sie. Cover again for 15 minutes. Its all about slow steaming and slow browning. The result? Perfect lightly browned sausages cooked to perfection. Hey thanks for visiting! Now go mad and cook ALL the side dishes for a huge English Breakfast treat! You wont regret it! Hi Archi! So nice to read your comments on my blog and also to see that you have become a follower! Gosh, what are you doing in Botswana?? In our part of the world, there are no sausages at least not of the pork variety and I don't think beef even comes close. Look forward to reading your blog too! I ask myself that question sometimes too!! I guess I love the wilderness areas. I am Zimbabwean originally then South African, now ended up in Botswana. I love your blog because you are doing more or less what I am trying to do...presenting local food in a way westerners can understand and prepare. A really great blog. Those must be some pretty thick sausage to cook 40 minutes in total? I always slow cook my sausage with about a quarter cup of water for about 20 minutes. Maybe I am doing them wrong after all. Thanks for the visit. I like the water idea too and also sometimes add a dash especially if It is a low fat sausage. Yes I am talking about full size sausages not cocktail size or slims. Also I am talking low heat..should only start browning on the one side towards the end of the first 20 mins. Takes practice and every stove is different. I do sometimes cook cocktail size and they are half the time to cook and a little more heat to brown. I tried a batch of sossies yesterday morning in response to medifast's query and indeed, a total of 30 minutes is adequate. 15 on each side very slow. However on very low heat 40 mins only makes them a little more succulent. Also slow cooking helps retain the juiciness and doesn't dry out the sossie. I have edited the post to reflect 30 mins as this isprobably a more average time. Thanx Medifast. Checked out your website too.